Rambharos Jha is an artist and writer based in the Mithila region of Bihar, eastern India. He grew up watching women decorate the walls and courtyards of their homes, and through watching and learning began to draw himself. In the last few years he has been working extensively on water bodies, a subject he describes as “one of my most cherished muses”. He has used the techniques he learned to create ‘Waterlife’, a series of illustrations and writings exploring marine life. The book is screen-printed by local artisans in Chennai using traditional Indian dyes. It is published by independent Indian publishers, Tara Books, and explores marine life. 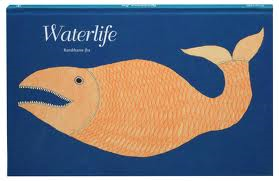 This entry was posted in swimming art and tagged Mithila, Rambharos Ja, Tara Books, Waterlife. Bookmark the permalink.